In 1958, the New York Yankees became World Series Champions, the hula hoop debuted in toy stores, and Charles de Gaulle was named Time magazine's Man of the Year. Another hallmark event of the year was the invention of an all-time favorite sweet: the candy necklace. 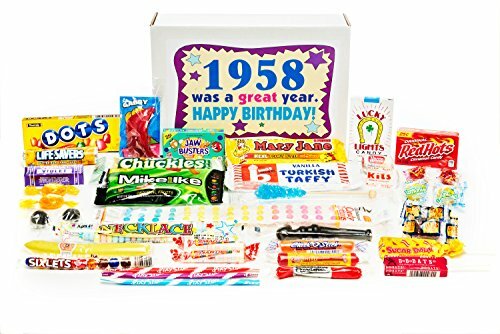 That good-tasting confection and lots more are included in Woodstock Candy's 1958 Birthday Gift Box. Baby boomers will get a flashback to their youth with a large assortment of all the best candies from their childhood. This vintage candy assortment is a unique and thoughtful "Happy Birthday" gift, as these items are not commonly found in stores.